Performers include: Scott Ryan, Damon Herriman, Damon Herriman, Justin Rosniak, Brooke Satchwell, Jackson Tozer, Nicholas Cassim, Chika Yasumura, Edmund Lembke-Hogan, and Matt Nable. 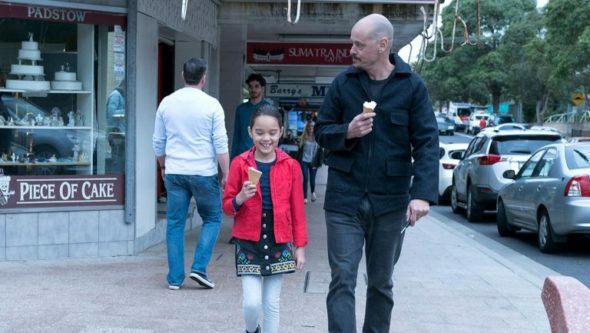 A drama TV show, Mr Inbetween was created by its star, Scott Ryan. It’s based on a cult film that Ryan made more than a decade earlier. At age 40, Ray Shoesmith (Ryan) is going through a bit of a midlife crisis. He struggles to contain his anger issues and juggle all of the roles that many adult men have in life — a father, ex-husband, boyfriend and best friend. His life is further complicated because Ray also happens to be a hitman-for-hire. Ray is a caring dad to his 8-year-old daughter, Brittany (Yasumura). She has a good relationship with her father, who she lives within a shared custody situation with her mother Jacinta and step-father Quentin. Ray is also dedicated to his older brother, Bruce (Cassim), who is experiencing the gradual reduction in mobility and coordination due to a motor neuron disease. One good thing in Ray’s life is Ally (Satchwell), a female paramedic he feels may be out of his league. But Ally is drawn to Ray, even if she doesn’t know the precise nature of his job. Gary (Rosniak) is Ray’s best friend of many years. They worked together a great deal in the past, but now, he’s married to Tatiana and is trying to live a more respectable life. Freddy (Herriman) is Ray’s boss and friend. He runs his business out of a strip joint, and is a guy that people go to if they need a hit put on someone or a debt collected. Nick (Lembke-Hogan) is a young heavy who’s been taken on by Freddy as a hitman-in-training and Ray is delegated to show him the ropes. What do you think? Do you like the Mr Inbetween TV show? Do you think it should be cancelled or renewed for another season on FX? The Shield: Would Shawn Ryan Like to Revisit the FX Series? Please do not stop this show ! I think that it’s different, original and really cool! I will keep watching this as long as you make ’em! This show should be continued./ How can it be done after 6 episodes?? Finally!!! An Aussie TV show we can all be proud of. I wanted more right from the get go… so pretty please, with sugar on top, make the next f—-ing season! I like it when stupidity is rewarded with a bullet to the head. My husband and I LOVE this show! Please don’t cancel this show! Love the show and hope there is more! I hope they renew this show. Please don’t cancel this show. I love the accents and the story line. Which in my opinion is great. I don’t care what time you put in on, I have it recorded as a series on my DVD players. Great show, fresh & raw. Hoping they renew the series. I think it has great potential to go on for a couple more seasons at very least.